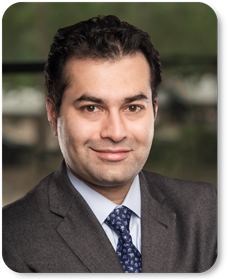 Samrat Karnik, Managing Director, currently serves as Co-Head of the Industrial Technology Group at Capstone Headwaters. Samrat has 17 years of middle-market corporate finance advisory experience across the full spectrum of advisory assignments. He works with industrial technology companies, with a particular focus on those in the instrumentation & sensors, industrial software & informatics, automation & control, energy efficiency and water & environmental technology sectors. Prior to joining Capstone Headwaters, Samrat was a senior banker in the M&A and Industrial Groups of both Duff & Phelps and Houlihan Lokey where he was responsible for covering and providing investment banking advisory services to companies in the Industrial and Environmental Technologies sectors. Prior to Houlihan Lokey, he was an Associate at The Nassau Group, and began his investment banking career at Berenson Minella, a boutique M&A and restructuring advisory firm. Samrat is also a Co-founder and Head of Strategy for Dreambox Emergence, which is a social enterprise focused on bringing the benefits of and access to 3D printing / additive manufacturing technologies to remote, underdeveloped communities globally.